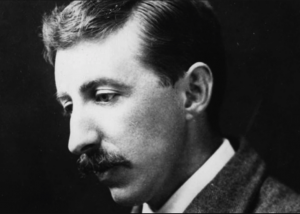 In this episode we read The Machine Stops by EM Forster, a cautionary tale written in 1909—on the threat of ungoverned technology. The story follows two characters—Vashti and her son, Kuno, during a time of post-apocalyptic earth. Mankind has been forced to relocate and live underground because the air on the earth’s surface has apparently become unbreathable. As a result, people live in empty rooms—or pods—underground, surrounded by buttons which, when activated, determine their day. There were buttons and switches everywhere – buttons to call for food, for music, for clothing. There was the hot-bath button, by pressure of which a basin of (imitation) marble rose out of the floor, filled to the brim with a warm deodorized liquid. There was the cold-bath button. There was the button that produced literature. And there were of course the buttons by which [Vashti] communicated with her friends. The room, though it contained nothing, was in touch with all that she cared for in the world. Vashti and Kuno live on opposite ends of the world and communicate, like everyone else, via “blue plates” which they hold in their hands while their faces appear on the plates and they talk to one another (Skype/FaceTime, anyone?). Vashti visits Kuno and learns that, in a rebellious act, Kuno travelled to the surface of the earth and found other humans living there. Yet, the Machine caught him and has threatened him with “homelessness”. Homelessness = death and traveling up to the surface–out of the machine–is a criminal repudiation of the deity–The Machine. Vashti returns home dismissing her son’s madness and continues her life inside the pod—but then The Machine starts to break down—life support to enable travel to the surface disappears and religion is reintroduced. What is the fate of our characters? We are joined again by the irrepressible and wonderful Dan Johnson and Jennifer Tejada, as we explore this fascinating, prescient story!